Farmhouse in Chianti with swimming pool with Jacuzzi, to provide self-service capabilities breakfast. The farm is ideal for a holiday in Tuscany. 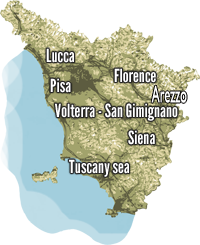 It is located in Chianti, halfway between Florence, Siena, San Gimignano and Volterra. The farmhouse has been recently inaugurated, has 5 apartments, all with private veranda, wi-fi and air conditioning. The owners can organize on request tastings of oil produced in a farmhouse and Tuscan dinners to make your holiday even more special. Within walking distance are restaurants, and services of all kinds. Golf enthusiasts can enjoy the distant fields less than 15 km from the farm. Lovers of relaxation will find a welcoming environment in which to spend a pleasant holiday.